Keep your beard looking healthy and maintained with beard balm. Beard balm helps tame your beard giving it a finished look. Our balms are smooth not gritty, and offer the right amount of oils to ensure your beard doesn't look greasy. 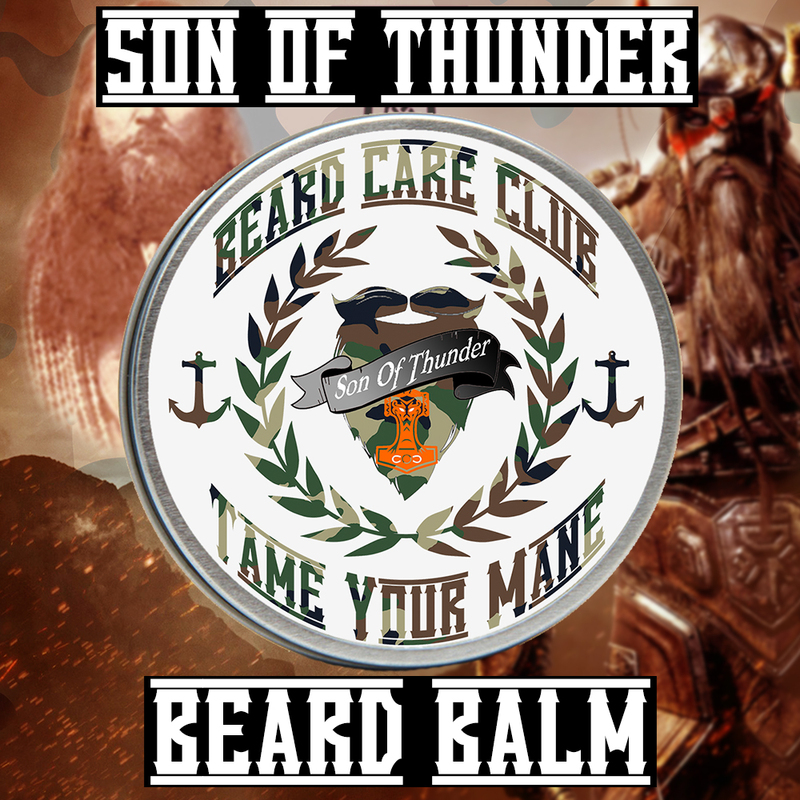 Our Son Of Thunder Beard Balm contains high quality oils, butters, and bees wax to seal in the moisture while giving your beard the hold you desire. Son Of Thunder was forged in Valhalla with the blood and sweat of Viking gods. The vessel that contains the beard balm was hand crafted from Thor's hammer. The balm itself was created using tears of a Liger, the blood of Great White sharks, and the teeth of a Tyrannosaurs Rex. We blend this all together using a broad sword and a battle axe while screaming "you can't stop me!". It took 761 years to create this beard balm, luckily reincarnation comes easy thanks to owning a majestic beard. Once you put this on, you will have the strength of 10,000 men, agility of a cheetah, and the speed to run a mile in under 2 seconds. Mortals can't resist this scent and will kneel in your presence. Donning Son Of Thunder comes with great responsibility...... you have been warned.